Originating in South America and used by the Guarani people for over 1,500 years as a sweetener for teas and medicines, Stevia rebaudiana leaves are widely used as a zero calorie substitute for sugar. 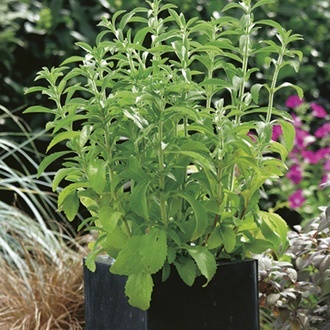 Despite being known as ‘Sweet Herb’, in the UK Stevia is not approved for human consumption, and can only be grown as an ornamental plant! Easy to grow, reaching a height of 30cm/12in, in the US the leaves are picked and used in all manner of culinary dishes.